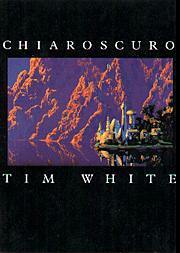 Tim White is the first person whose name I ever identified with cover art -- genre or otherwise. I'd never really paid much attention to book covers until, as a young teenager, I saw White interviewed on the TV. It was only then that I realised that cover art could be more than mere packaging, was worth lingering over, and that some of the artists were really very good. What struck me first was the pin-sharp clarity of his images and the vivid, other-worldly use of colour -- almost too sharp, too colourful, the excess clarity somehow appropriate for images of scenes from beyond the everyday norm. The arrival of White's Chiaroscuro, a reissue of a book first published in 1988, presented a welcome opportunity to look more closely at the artist's paintings, and to get to know more about how he works and what he tries to achieve. Fine as this book is, it only met my expectations part of the way. What I didn't notice on that long-ago first encounter with White's work was the subtlety with which he manipulated what had first struck me as exaggeration in his work: as well as over- there was under- too. The too-perfect sharpness was balanced by clever use of blur and loss of distant detail, the apparent over-saturation of colour contrasting with more subdued backdrops. These techniques are exemplified in 'Windmaster's Bane', in which miniature humans and beautifully glistening, armour-plated lizards sit in perfect clarity against a heavy forest gloom, broken by shafts of sunlight; in 'Guns of Avalon', where sword-bearing, shiny purple figures with heavily taloned feet and bat-like wings emerge from a fairy ring into what would otherwise be an idyllic woodland glade; and in the extraordinary 'Telzey Toy' in which tiny humanoid figures appear to have grown together into a tendrilled, curving, ladder-like structure, all set against a dreamily calm tropical backdrop. Impressive as much of the work in this book is, I found myself returning again and again to the question, what are the words for in an art book? At worst, they are merely there to fill the space between the pictures -- which are, after all, the reason for the book's existence. At best, the words should offer some kind of critical insight (if written by another) or explication of the artist's approach, ideas, theories. The words in Chiaroscuro are, quite simply, not enough to do justice to the artwork. There's little, if anything, in the way of critical analysis, with most of the text consisting of banalities about the Celtic origins of sword'n'sorcery, the nature of fairy legends and so on. Forgive me, but if I wanted that there are many far better sources than in the bland paragraphs scattered through this book. Someone clearly decided that this shouldn't just be a portfolio, but unfortunately they opted for coffee-table platitudes to bulk out the book. The text is most interesting when it offers some insight into the artist's approach. One of several artists commissioned to provide sample artwork for Clive Barker's Weaveworld, Tim White provided a set of roughs, reproduced here with the accompanying comments he submitted to the art director. He was subsequently asked to provide a detailed rough of one corner of the design, showing how he proposed to use the carpet (now much developed from the original straightforward patterned carpet in Barker's book) as a framing device. These few pages, following a painting from the publisher's initial approach, through a series of developing ideas, to finished artwork are probably the best in the book. Also lacking from the book is detail about the images themselves. Most paintings go unremarked, accompanied only by a title. Tucked away at the back, we find an index of paintings which actually gives a year for each work, although this doesn't tell us if it is the year of creation or year of publication. It would have been so much more informative to accompany each painting with a few notes. As it is, Chiaroscuro offers a lovely selection of works by a fine artist, but the reader leaves the book having learnt little. A beautiful book, as we expect from publishers Paper Tiger, but also a wasted opportunity.